Scientists and computer engineers have developed an interactive climate app - CO2 Modeller – which can fit in your pocket and help you to gauge the future effects of carbon emissions around key sensitivities of the Earth’s climate. 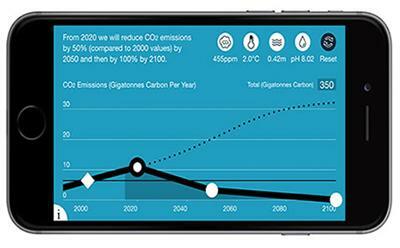 The new app, CO2 Modeller, provides an interactive tool to allow anyone - from members of the public to policy makers - to explore for themselves the implications of delaying emission reductions on their tablet or smartphone. Using an easy-to-follow touchscreen, users of the app can review how carbon emission targets and outcomes will impact four key areas of climate change - future global warming, sea level rise, ocean acidification and CO2 concentration - over the next 85 years. The app’s developers, from Ocean and Earth Science and Electronics and Computing Science, believe that making climate modelling tools so accessible in this way will help us gain a greater understanding of the carbon emission targets and reduction policies proposed at international policy forums, such as the forthcoming COP21 Paris climate talks. The challenge to developing CO2 Modeller was to cram a climate model, something often associated with international teams of scientists using supercomputers, into a mobile device.